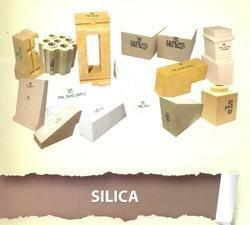 Our Silica Insulation Bricks are manufactured using premium quality china clay, kyanite, saw dust, etc. from reliable vendors. These are in high demand all across the globe and are designed to perfection by our team of efficient personnel. We can also customize our range as per the designs and specifications of our esteemed clients. We are renowned as an affluent manufacturer, exporter and supplier of an excellent quality assortment of Silica Insulating Bricks. These bricks are manufactured in our advanced production unit latest technology and supreme quality raw material by following the international quality standards. 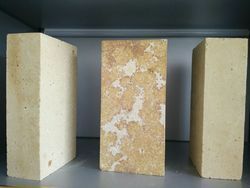 Silica Brick for hot blast stove are characterized by low thermal expansion, slight residual quartz, lower true density, and good thermal shock resistance at 600 and above, high refractoriness, under loads low creep as well as regular precise size. Main application covers high temperature zones such as hot blast furnace dome, upper stack and upper checker unit and so on. We are offering wide range of qualitative Silica Bricks for Glass Tank, these are manufactured from high grade quality material. Our clients can avail these products at the most competitive prices. These are highly in demand for their unmatched quality and unbeatable price. Size: 12 In. X 4 In. X 2 In. The Fire Bricks Supply Co. Size: 6 In. x 2 In. x 4 In. Properties of the hot blast stove silica bricks are very carefully controlled. The gain size, transformation of tridymite and low quartz content are critical for good performance.